One of the most interesting aspects about beer is when you come across a brew with a clear message of intent. There is something fascinating in seeing how other countries interpret beer styles when they have no historical link with the style they intend to replicate. The question is how near are they in replicating the real thing. 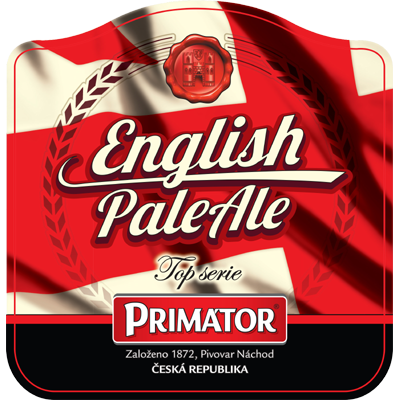 One such beer comes from the Nachod Brewery in the Czech Republic under their Primator brand. Founded in 1872 the brewery has a reputation for making good quality lagers and especially some stronger dark (Doppelbock) brews that weigh in at an impressive 10.5%Alc.vol. that are often very well made. What makes this particular brew a little different is the message, which is loud and clear, this is the breweries interpretation of an ‘English Pale Ale’. A bold move indeed, but there may be one major drawback, the method of production. The major difference in lager an ale production are the yeast types. For the lager brewer ‘bottom fermenting yeast’ (anaerobic) is the all important fungal ingredient in producing the style, combined with a lengthy ‘lagering’ period at very low temperatures. This gives the beer its often crisp, clean, refreshing flavour notes. The ale yeast is however is ‘top fermenting’ (aerobic) and ferments quicker than the lager yeast and at higher temperatures producing notably different characteristics, being fruitier, rounder, and bigger in flavour. It is possible of course for a lager producer to incorporate a top fermenting plant in their brewery, just as many ale producers who wish to produce a more authentic ‘lager style’ will do the contrary. There are however a number of brewers in the Baltic and Eastern Europe who like to add the ‘ale’ tag who do not use the true techniques, and ironically given the EU legislative pressure to do things right, there is little in this instance in the way of law to stop them. What then of the Primator brew? Do we have something made in the true ale manner, and what of the flavour? Well it seems the beer is indeed made by top fermentation, as claimed on the breweries web site, so that is a promising step in the right direction. So what of the beer itself? The aroma is good, of light mown character and in terms of flavour the beer does indeed have the hallmarks of an English style pale ale. The descriptive of a ‘pale ale’ is about right, as it lacks character to make it truly distinctive, but presumably this was the aim, however a little more character would have been welcome. Nevertheless it is a worthy stab at the style. A Stout and IPA exist in the range also but have not been tried as yet, and perhaps an ESB style would be a good move.